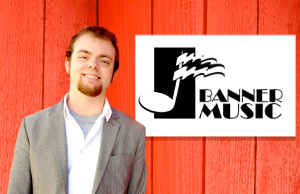 Banner Music is proud to announce that Kevin Kleindienst is now part of the Banner Music team. Kleindienst will be working closely with President Camilla Kleindienst in the daily operations as well as tour manager with artists and involved with artist development. Kevin Kleindienst grew up in rural Missouri in a musical family. Throughout his youth and as an adult Kleindienst attended concerts and connected with bands and performing artists. He formed business connections to bands and venues. In 2013 he decided to move to Tennessee and put his music business abilities to work for Banner Music.